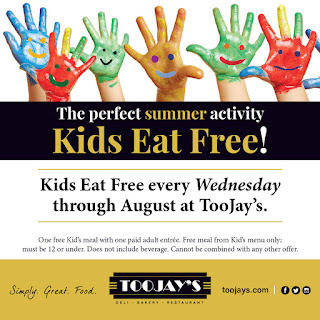 WEST PALM BEACH, Fla. (June 13, 2017) – Kids eat free this summer with the purchase of one adult entrée every Wednesday now through August 30 at TooJay's, the restaurant known for its generous servings of homemade, New York deli favorites. Children age 12 and under must order from the Kids Menu which features popular breakfast, lunch and dinner options. A few of the breakfast favorites include French toast, half of a Belgian waffle and bacon strips. Lunch and dinner favorites include the hamburger, Jr. Tuna Melt, Chicken Salad Chop Chop, Mac & Cheese, and more. 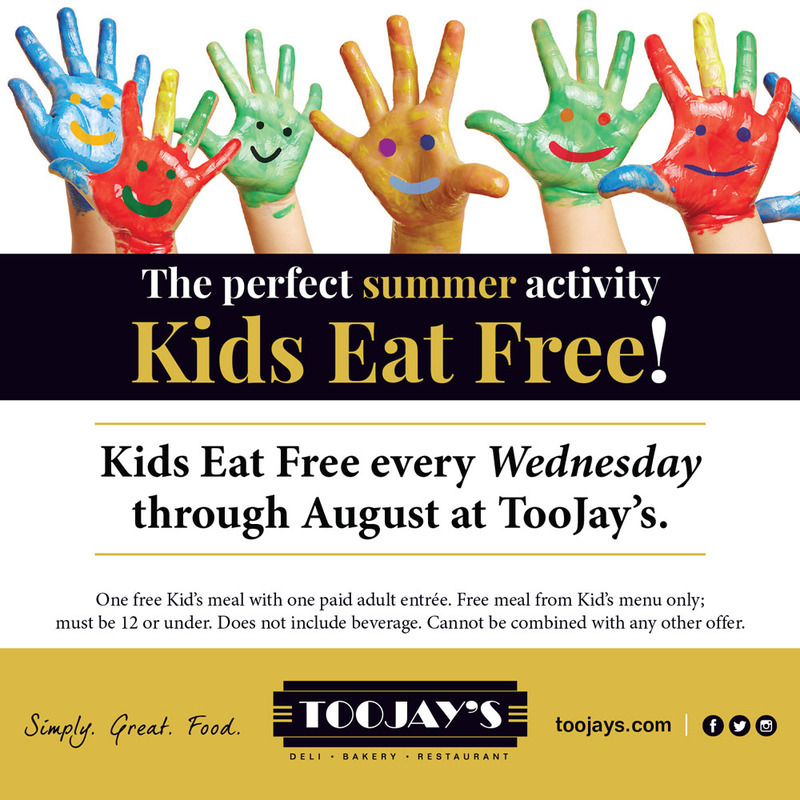 All lunch and dinner meals come with a famous TooJay’s mini black & white cookie and a choice of two sides from the wide selection of healthy carrot sticks with Ranch dressing, Mandarin oranges, chocolate pudding, red grapes, french fries and apple sauce. This special offer does not include beverages and cannot be combined with any other offers. For more information about TooJay’s, visit TooJays.com. Follow TooJay’s at twitter.com/therealTooJays and instagram.com/toojaysdeli or visit the Facebook fan page, which has over 81 thousand fans, and become a fan at facebook.com/TooJaysDeli.